The mercury hit over 80° today. So, of course, I would roast a chicken. What possessed me? Shouldn’t I be eating sushi? Shouldn’t I be sitting under a tree chewing on raw snow peas? Yes, but I had planned this meal on a cold day, thinking that the chilly spring that we have been having would continue to the end of the week. I wrong, but I decided to go for it anyway. I had a chicken. I have a surfeit of apple cider vinegar. I have to eat, so why not? This recipe comes from a new cookbook that recently hit the market by the great-niece Chef Boyardee. What? Chef Boyardee? The Chef Boyardee? From the can? The ravioli in a can? Yes, that can. He was a real person. Ettore “Hector” Boiardi immigrated to America with his family around the turn of the century. They settled in Cleveland and like many immigrants, started a restaurant. In response to demand, Boiardi’s started sending customers home with Italian food kits so they could reproduce what they made in the restaurant at home. It was such a success that Hector, along with his brothers Mario and Paul, began jarring their sauces and selling them under the name Chef Boyardee in 1928. At the time, they became the largest importer of Parmesan cheese and olive oil in the country. They moved their canning factory to Milton, Pennsylvania, where they convinced local farmers to grow the right kind of tomatoes that they needed for their sauces. They also grew and picked their own mushrooms at the plant. So what happened?! How did they go from that to Beeferoni?! Well, after the WWII, the family sold their company — which had been supplying the troops during wartime — to a larger conglomerate. And so it goes that . . .
. . . their descendent would be hot, live in a TriBeCa loft, and run Italian cooking classes for a living. Anna Boiardi cooks real food. Real Italian food. And this recipe for Apple Cider-Roasted Chicken with Rosemary is really good. 2. Place the chicken in a deep pot. The pot should be large enough to hold the chicken comfortably, with enough room on the top to spare. If you don’t have a pot large enough, you can improvise with some Zip-loc bags, doubled up. Add the vinegar and enough water to cover the chicken completely. Let the chicken soak for 30 minutes. After 30 minutes, remove the chicken and rinse it well under cold water. Pat it completely dry on the inside and out. At this point, your oven should be at the right temperature. 2. Put the chicken in a large cast-iron pan. Sprinkle the cavity liberally with salt and pepper. Place the garlic, the lemon, and one of the rosemary sprigs in the cavity. Truss your bird tightly. If you haven’t trussed a bird before, here is a handy video to help you. 3. Turn the chicken on its back, and massage about a teaspoon and a half of salt and about a quarter teaspoon of pepper into the skin. Be sure to get all the nooks and crannies. You want to work the salt in until it begins to dissolve. Massage in one of the two tablespoons of olive oil. Flip the chicken breast-side up, and repeat what you did to the back of the chicken. Work in another one and a half teaspoons of salt and quarter teaspoon of pepper. When the salt has dissolved, massage in the remaining tablespoon of olive oil. 4. Arrange the aromatics (the carrots, celery, the remaining rosemary sprig, and onions) around the chicken. Drizzle them with olive oil. 5. 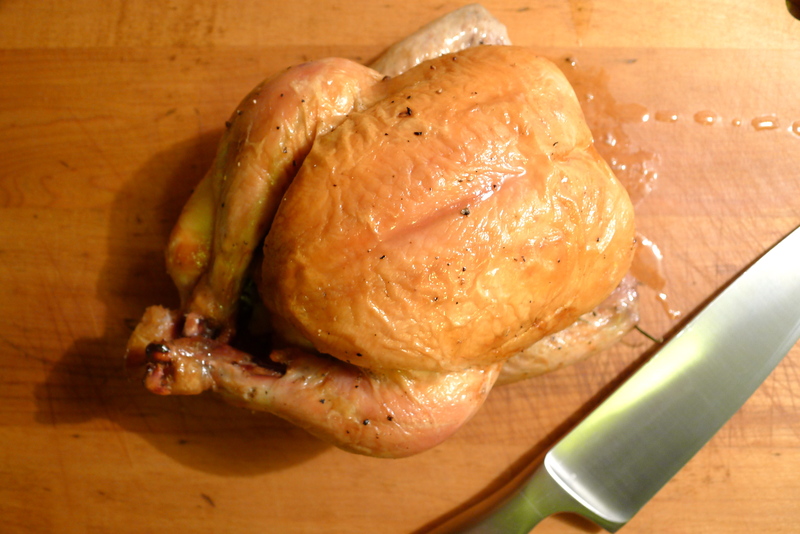 Roast the chicken for about until it reaches an internal temperature of 165°. At that point, the juices should run clear when you pierce the deepest part of the thigh with a paring knife or a skewer. About halfway through cooking, you can also drop the temperature to 375°, and continue to roast it until it hits the target temperature. I’ve done it both ways depending on my mood. You can turn the vegetables halfway through the cooking time too so that they don’t dry out, and that they get well-coated by the drippings. 6. Let the chicken rest for about 20 minutes before carving. Serve with some of the juices spooned over the top.